The airline has cumulative losses over USD 750 million resulting in substantial debt servicing payments each year. The balance sheet also contains a negative net worth of USD 400 million. Performance of the carrier may be assessed from three different aspects; (i) Performance based on Air Transportation (core business or carriage of Passengers, Cargo, Baggage, and Mail. (ii) Performance as a Company which includes core business besides other profit centers, i.e., Ground Handling, Engineering, Aviation College, SriLankan Holidays, Simulators and Miscellaneous Income (iii) Performance as a Group which includes Catering. Finance Charges (debt servicing) impacts Group performance only. A reliable source, on condition of anonymity stated, the unaudited operating deficit from Air Transportation during FY 2017/18 exceeded USD 120 million, up from USD 111 million in 2016/7. Net Loss to the Company before Dividends (from SriLankan Catering) amounted to nearly USD 55 million, up from USD 43 million during the previous year. Group Net Loss amounted to more than USD 85 million, up from USD 64 million in 2016/17 (USD 64 million excludes USD 98 million compensation costs of three A350 aircraft). Currency losses during the year exceeded Rs 1 billion. The main reason for the airline to continue making losses is the operation of an expensive fleet of wide-bodied aircraft. Lease charges for seven such planes amount to around USD 1.1 million per month per aircraft. The airline supposedly requires aircraft with lease rentals not exceeding USD 500,000 per aircraft per month besides addressing a few other issues such as reduction in workforce to operate its current schedule profitably. The Restructuring Plan prepared by CEO Ratwatte and his team and approved by directors require a fleet of wide-bodied aircraft due to major shareholder/GoSL’s insistence on long-haul routes such as Colombo to London. Neither the airline nor GoSL have considered a business model of a regional airline operated exclusively with narrow-bodied aircraft. The management and directors failed to produce such a Restructuring Plan and provide GoSL with different options for consideration. The lack of a proactive approach and sense of urgency is a serious failing. Having advertised the post of CEO in May 2015 and earmarked a candidate for recruitment, a final decision was differed by directors for several months due to Parliamentary elections. They failed to act on the basis, the airline (any company) needs a CEO regardless of the outcome of elections. The Yahapalana administration directorate appointed on February 12, 2015, comprised of Ajith Dias, Joseph Brito, Mahinda Haradasa, Chanaka de Silva, and Lt. Col. Sunil Peiris. Rakhita Jayawardena, Harindra Balapatabandi, and Nirj Deva Aditya were appointed subsequently. 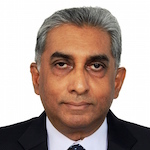 Jayawardena functioned as protem CEO and Peiris as Executive Director HR from March 2015 till the recruitment of Suren Ratwatte as CEO in October 2015. Former Emirates nominated CEO Peter Hill was hired as a Consultant to Board of Directors but resigned after two months. Whereas Peiris resigned in August 2017, remaining seven directors left at the request of the major shareholder/GoSL in March 2018. Commencing shortly after their appointment, directors operated in an authoritarian environment and regularly found themselves gagged/overruled by the major shareholder/GoSL. Following are a few examples which clearly illustrates the trying circumstances under which they were required to function. The position of Chief Commercial Officer (COO) was advertised simultaneously with that of CEO in May 2015. Several directors had conducted initial interviews via Skype. However, subsequent discussions had been with the Chairman, and Director Haradasa without even the knowledge of protem CEO and Letter of Appointment (LoA) issued to the selected candidate before informing other directors on November 27, 2015. In a vote taken due to vehement objections by some directors, Chairman and two directors voted in favor of recruitment whereas four voted against (one director had left early). Main misgivings raised by dissenting directors had been; Duplication of costs as the company already had a person on its payroll suited for the job, but he preferred to remain overseas, the candidate who was a former employee of the airline was over the company retirement age of 60 years and had a track record of regularly changing jobs. CCEM directive 08/12/2015/05 dated December 08, 2015 overruled the decision by a majority of directors and directed recruitment of the candidate. The release of the LoA before Board’s decision is indicative; Board approval was considered a mere formality in some quarters. As customary in most reputed companies, CEO Ratwatte’s LoA, who commenced employment on October 15, 2015, stipulated a probation period of six months which was due to end on April 14, 2016. Directors discussed the matter during their meeting in February 2016, and it was decided to carry out a confidential Performance Appraisal. A Performance Appraisal with requisite Key Result Areas was circulated to be completed by each director confidentially, collated by Auditors, discussed, and a final decision made at the next Board meeting. On March 24, 2016, instructions had been received from Minister of Public Enterprise Development to extend CEO’s probationary period by a further six months owing to the uncertainty in the company resulting in the discontinuation of the Performance Appraisal project. The Chairman alone had supported immediate confirmation of CEO to his post but had eventually agreed to communicate the majority decision by directors to extend probation period. On April 28, 2017, the Chairman informed, both Prime Minister and Minister of Public Enterprise Development had requested the confirmation of CEO to his post at the earliest. Director Deva Aditya too had confirmed a similar request by the Prime Minister. Left with no other alternative, Directors resolved to confirm CEO to his post. On August 25, 2016, directors approved the short-term wet lease of one A330-300 to Pakistan International Airlines (PIA). Despite PIA’s financial standing being worse than that of SLA, the lease agreement prepared by management for Board approval did not contain a clause to charge interest accrued on delayed payments as confirmed by the CEO to directors on October 27, 2016. Neither did it include a requirement for PIA to furnish a standing order to their bank for settlement of lease charges on due dates. In a bizarre development, CEO confirmed to the directors, the existence of a late payment penalty clause in the Agreement but not implemented, when he met them on November 24, 2016. The discrepancy between his statements on October 27 and November 24 went wittingly or unwittingly unnoticed. PIA failed to settle lease charges on due dates and SLA had numerous difficulties in collecting dues. The wet lease agreement was to be followed with the dry lease of three more A330-300 aircraft by PIA for six years commencing November 01, 2016, December 15, 2016, and February 01, 2017. The lease rental per aircraft per month was in the region of USD 1.1 million. As the leasing out of three aircraft would have caused a shortage of aircraft to operate the carrier’s schedule, CEO requested and received approval to extend lease agreements of three 18-year-old A330-200 aircraft due to expire in January 2017. Directors, on August 25, 2016, approved extending lease agreements to “be signed only after the dry lease agreements of the 3 A330-300 aircraft are signed with PIA”. PIA, for various reasons, prevaricated over the long-term leasing of three aircraft. Besides, the plane obtained on a short-term wet lease returned after six months. Meanwhile, SLA ended up having three unwanted A330-200 aircraft for a further period of six years due to the renewal of lease agreements in September 2016. When questioned by directors, management claimed, the caveat in Board approval though not incorporated in the lease agreement had been attached to the connected documents (Power of Attorney) authorizing the signing of the lease agreement. They claimed it was sufficient to exit from the extension, in case PIA sub leases did not materialize. Several directors had challenged the validity of this statement. Most directors felt CEO had exceeded his authority in extending the three lease agreements besides being kept in the dark and the resulting implications from September till November 2016. As a result, directors, on January 25, 2017, took a vote of no confidence on the CEO. Five Directors voted as having lost confidence whereas two directors voted against the motion with one abstaining. During the same meeting, directors, by a vote of four in favor, three against and one abstaining voted to return the three aircraft to the lessor. The CEO was directed to communicate the Board’s decision to the lessor, attributing same to non-realization of PIA sub-lease agreement. 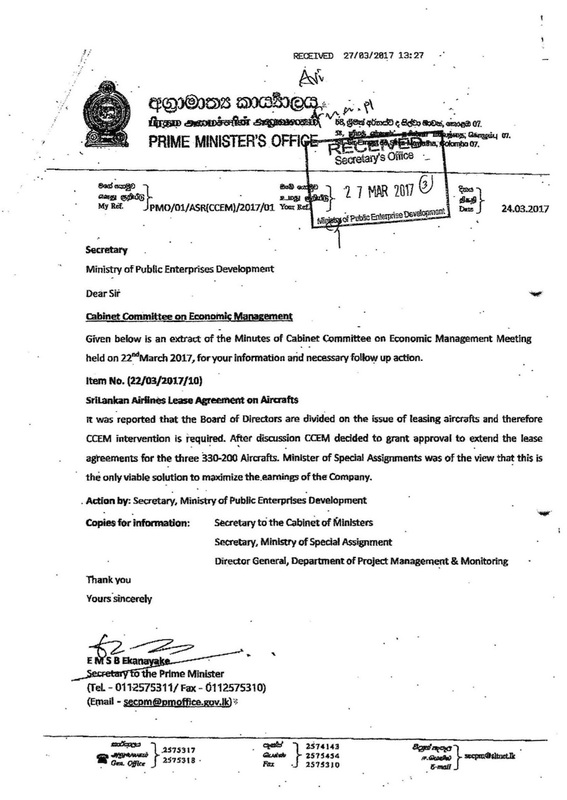 Nevertheless, Cabinet Committee on Economic Management (CCEM) item no 22/03/2017/10 overruled decision by a majority of directors and granted approval for the lease of three A330-200 aircraft for six years. These are but three of the numerous occasions, on which the major shareholder/GoSL has intervened and overruled Board decisions in the affairs of the airline. Inability to delegate and micromanagement is a drawback often found in Sri Lanka. All tiers of administration/ management top down customarily involve themselves in matters not requiring their attention. GoSL in its capacity of major shareholder appoints a certain number of directors. Strictly speaking, from a company law perspective, directors should elect a Chairman among themselves. In the case of SLA, GoSL appoints the Chairman. Having named its nominees as directors, GoSL contravenes Company Law by involving itself in the day to day affairs of the company, especially in matters such as recruitment. In the developed world, directors would be responsible for policy formulation and setting of direction whereas day to day administration/operations is the responsibility of the CEO and his team. The division and demarcation of power between Shareholders and Directors are governed in part by the Statute of law and partly by Articles of Association of the company. Shareholders may have their say during Annual General Meetings when they may communicate their requirements to directors and even remove directors if they so desire. The forum for shareholders, major or minor, to voice their concerns is the Annual General Meeting. Being the major shareholder and source of funding does not and should not permit GoSL to micromanage the airline. That said, directors too are guilty of micromanagement. Involving themselves in operational matters such the airline’s Upgrade/Excess Baggage Waiver policy is a waste of valuable time. In a progressive airline, such functions are dealt with by the Commercial Division and CEO. Since the departure of Emirates management, non-Executive Chairmen have empowered themselves with authority to upgrade and waive excess baggage. It is a status symbol for the holders of the office. Notwithstanding the availability of a Board approved policy document for selection of General Sales Agents (GSA), each appointment/extension require individual board approval, an absolute waste of time. In airlines such as Emirates, such matters are disposed of by the responsible department in the Commercial division. The Ministry of National Policies and Economic Affairs, on March 06, 2017 appointed a Committee of four ministers (Ministers for Development Strategies & International Trade, Special Assignments, Public Enterprise Development and Deputy Minister for PED) and one bureaucrat (Snr. Advisor, Ministry of NP&EA). 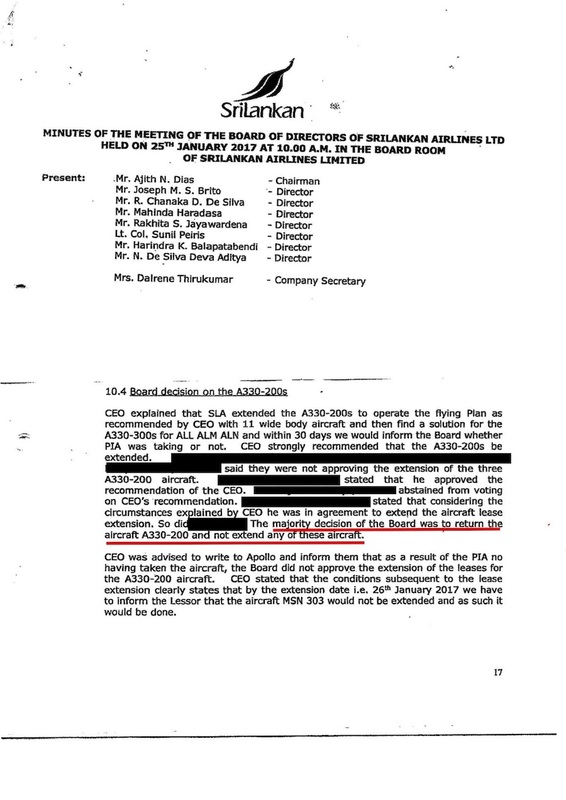 They were directed to resolve issues when ‘SriLankan Airlines Board of Directors find difficulty to reach consensus on certain matters at Board Meetings.’ The committee’s decisions ‘would be final.’ ‘Difficulties to reach a consensus’ in real terms translate to decisions by a majority vote of directors running contrary to requirements of GoSL. Board meetings were also prohibited other than the regular monthly meeting vide MNPEA/PLN/FA/MM/2017 dated March 14 and 17, 2017. Such situations bring to the fore the vexed question of liability for decisions made by Committee members overruling board decisions as well as decisions made and passed down to directors for implementation. In the event of adverse findings during an investigation or Commission of Inquiry at a future date, would it be Committee officials or directors who will be held accountable for committee decisions? If not all, at least some of the outgoing directors who registered their dissent in some instances when they felt GoSL interventions was not in the best interest of the company is commendable. There is no record of directors holding office during the Rajapaksa administration resisting incorrect directives, despite their high standing in the corporate world. The major shareholder’s stubborn insistence in retaining 51% equity has been the primary stumbling block in finding a strategic partner. Investors and airlines are yet to forget the outcome of 40% equity acquired by Emirates in 1998 and their inglorious departure in 2008. In preparation to rolling out the PPP project, GoSL appointed National Savings Bank (NSB) as Lead Managers. NSB went on to select KPMG and BNP Aviation (a subsidiary of French bank BNP Paribas) as consultants. The illogical appointments of NSB, an institution with no experience in restructuring companies rather than one of the two state-owned commercial banks besides the selection of KPMG and BNP Aviation without a selection process dumbfounded the financial community in the country. Having progressed through the process of calling for Expression of Interest (EoI) and shortlisting three interested applicants, USA based Texas Pacific Group (TPG) was selected for further negotiations. TPG required a Due Diligence to be carried out and appointed Accenture Consulting in Ireland for the purpose. Their main requirements were; (i) Noninterference from GoSL. (ii) The airline must enjoy Ground Handling monopoly. (iii) Fuel at market price. (iv) GoSL to take over past debts. (v) Management control for five years. TPG abandoned the exercise even before completion of Due Diligence and informed GoSL of their withdrawal due to the availability of better investment opportunities in India. Ministers Kabir Hashim, Malik Samarawickrama, and Sarath Amunugama, tasked with speaking to other parties including Emirates and Qatar Airways of entering onto a PPP arrangement with SLA also came to naught as did President Sirisena’s appeal to the Ruler of Qatar during his state visit to Doha. In late 2017, GoSL appointed two committees comprising of a Ministerial Committee headed by the Prime Minister and Officials Committee chaired by Secretary to Treasury to make out and finalize a restructuring plan for the airline. The Officials Committee was required to prepare a plan by early 2018 to be presented to the Ministerial committee for approvals and implementation in the first quarter. The Officials Committee selected Nyras Aviation Consulting to formulate the plan. GoSL appointed a new Board of Management termed ‘Restructuring Board’ in the first week of April 2018. In another first timer, Mr Johann Wijesinger, former employee of SriLankan Airlines and currently Managing Director of Leisure & Aviation at the Hayleys Group has been appointed to the Board this week. It is reliably understood, Nyras have completed their task and collected the agreed fee in full. However, the prepared plan is yet to be ratified by both, the airline and GoSL. Meanwhile, the COO who was over 60 years of age has relinquished duties, and rumors are afloat the CEO is considering giving up his position. There have been news articles of Peter Hill, the former CEO during the Emirates period has had discussions with the present board to be reappointed. A former CEO from an Airline in the Pacific is also making headway for the position. There is much angst among staff as there does not seem to be any definite direction or strategic plan to move forward. Can the airline survive under these circumstances? With all this uncertainty the carrier continues to operate. How long will the cash last before the airline has to go in for another handout from the government or declare bankruptcy? Even though committees are in place and consultants hired towards the restructuring of the airline, there seems to be no urgency to get on with the task at hand. Who is responsible for this apathy and why are those responsible not giving priority to making things work? It would be of interest for readers to know, 86-year-old Air India, with an accumulated debt of around USD 8 billion has been up for sale. The Indian government has offered to sell a 76% stake to a local or foreign entity. An international airline may also buy a stake up to 49%. Nevertheless, the Indian government was forced to extend its deadline till May 31 due to no takers. Unlike South Asian nations still obsessed with outdated notions of ‘national carrier’ and ‘flag carrier,’ western countries have privatized their airlines. The single largest shareholder of International Airlines Group, owning company of British Airways is Qatar Airways with 20.1% equity. Air France acquired KLM Royal Dutch Airlines. The French government holds only 14% of the Air France-KLM group. Its CEO resigned last week rather than give in to labor unions demanding higher wages from the loss-making company while the government declined to get involved. On the other hand, directors of SLA, in 2016 gave into staff demands and granted pay increases across the board as a few of the ten unions refused to agree to a wage freeze. The Company reported a loss of LKR 28.9 billion in the year ending March 31, 2017. On the other hand, despite challenges arising from withdrawing some flights to the USA, Emirates Group has just posted a profit for the 30th consecutive year of USD 1.1 billion for the FY ending March 31, 2018, up 67% from previous year. The group has declared a dividend of USD 545 million to its major shareholder. The carrier has achieved a commendable 4% growth in passenger traffic beside a 4% reduction in workforce. Emirates took to the skies in 1985, six years after SLA with a startup handout of USD 10 million from the Ruler, a leased Boeing 737 and an Airbus A300. Its fleet today consists of 254 aircraft operating to 141 destinations with a further 220 in their order books. The Initial handout of USD 10 million from the Ruler of Dubai was returned, and the airline receives no government subsidies. Dubai, unlike other emirates of UAE, has limited oil reserves and has turned from net exporter to a net importer. The airline’s success story is based on being managed by aviation professionals and operated with well trained, competent and dedicated staff. The major shareholder, state-owned Investment Corporation of Dubai, plays no role in the management of the company. The Presidential Commission of Inquiry has its work cut out. 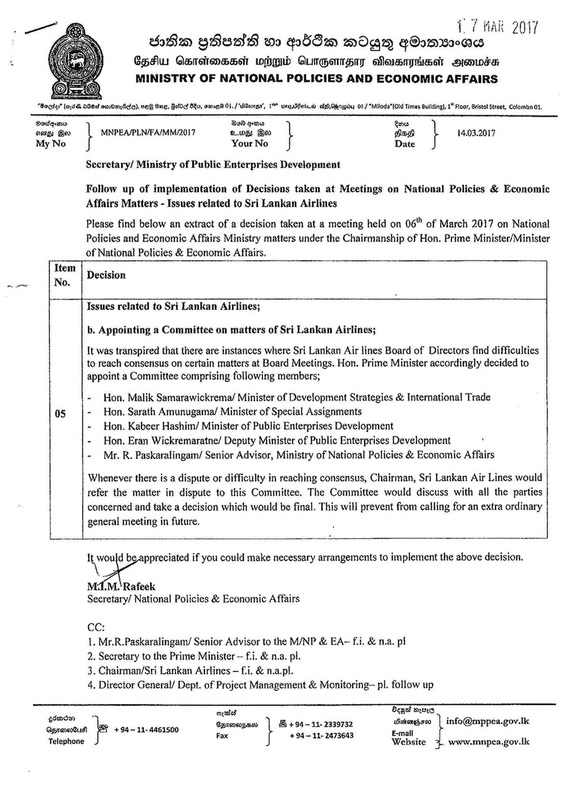 It has been mandated to inquire into allegations of large-scale frauds and malpractices in SriLankan Airlines, SriLankan Catering Ltd, and Mihin Lanka (Pvt) Ltd, during the period of January 01, 2006 to January 31, 2018. Terms of reference include investigation of both financial and administrative mismanagement of the airline. The unraveling of the basis and those responsible for the purchase of six Airbus A330-300 and eight A350-900 aircraft is an absolute necessity. That said, mismanagement of the airline by GoSL and directors during administrations of both 2008/15 as well as 2015/18 require thorough investigation. Those responsible must be named and held accountable. The lack of appetite among investors to invest in government-owned loss-making national carriers, essentially white elephants, is obvious. In 2016, a Deputy Minister stated, the future of SriLankan Airlines must be a commercial or political decision. After 70 years of independence and failures of Air Ceylon, Air Lanka, and SriLankan Airlines, it is a foregone conclusion, the major shareholder/GoSL is incapable of operating a commercially viable airline. In the absence of a strategic partner, the choice is between winding up the airline or continue as a political airline at the expense of many for the benefit of a few. Some where it says Suren Rathwaththa is not quitting and he is still hanging, probably because Charitha Rathwaththa, Ranil’s economic expert friend is his brother. That is how good and Ranil is. Rajeewa…high time you settle your personal grudges over CCO appointment in an appropriate forum not at the expense of CT readers. Don’t continue your ill will over the board decision to disqualify you at the interview on merit. You are getting personal thanu. Please point out errors in his presentation. FYI, I never applied for post of CCO, only that of CEO and have no ax to grind. Do get your facts right. We were told that the Board of Directors and the CEO of SriLankan Airlines have been replaced. Is this true or false? SriLankan Airlines was a brand. Political interference buggered it. We will not be able to find a partner. We have to choose between ‘winding up the airline or continue as a political airline’. No no no. There is someone hovering to grab the whole thingy for one rupee. An appropriate caption would be “Who is Mismanaging Sri Lankan Airlines ? “”. A national airline is the ultimate Pride of any country. It has immense Brand Value. I remember long years ago flying Air Lanka when they were newly set up with the assistance of Singapore Airlines. I fly a lot on Singapore Airlines and I would say Air Lanka was on par or even better. Politics and Corruption is destroying everything dear to the country. Not Only Sri lankan Air lines, nothing can be run profitably in Sri lanka because the politicians appoint there people and they screw it up. See during the whole time Mahinda Rajapakse Sri lankan airline was a disgraceful business. I heard those CEOS are paid indirectly via foreign contract company. So, that is previous govt corruptions and this govt extnding it. why a contract can not be cancelled. See even the Nuclear deal that involved all the five major security council countries were cancelled. Why we can not. Ranil still says I know everything and I did not anything wrong. Maithripala sirisena and Ranil are preparing to come back. So, expect the next five years. nothing will ever change and all what politicians want is to ensure their interests are served.Government has recently appointed a new Board whose credentials do not impress much specially considering the mess SriLankan is currently in.Out of the two new directors appointed few days ago,Mr.Wijesinghe though may have some Aviation background the very background poses an issue with regard to conflict of Interest.He would now have access to confidential information which can be made use of to the advantage of the the company he is employed with. As his company represents few Airlines that are directly competing with SriLankan on some routes,where would his loyalty remain ? So much for Government”s efforts in appointing professionals as Board members to state run institutions !!! People need to understand the following about SriLankan Airlines. The new airbus fleet is leased at above market rates, on 12 year leases. This represents a huge cost. The lease rates are so high that it is impossible to make money with these aircraft. In addition it appears these contracts do not have a termination clause. There are still 4 A350 aircraft on order from airbus. It appears these were purchased at full price (normally Airlines get up to 50% discount). There is still U$800 million due on this order. Once again this order appears to not have a termination clause. The combined future costs of both contracts will be in excess of $2 Billion – this is why nobody will buy the Airline. Nobody wants this liability. Both orders are examples of Racketeering – a small group of people have pocketed a lot of money in Commissions. There is no way out of this mess and there is no money to cover these massive liabilities. Bankruptcy is all that remains. Anyone know if Suren got his Rs. 10 Million bonus for doing absolutely nothing? I’m betting he did.